What's your take on this issue? If and when writing in paper becomes obsolete, eventually over time, future generations would have no knowledge on how to write, it would become a lost art. People will not forget how to write by hand. We still write by hand. When I write it is common to have my drafts handwritten. I fill many books with these drafts. Yes I agree with you, and it's a bit absurd ditch writing. I guess it's somewhat of a concern since many are using gadgets nowadays. In fact, good handwriting has become of a past thing. It only survives due to school practice. If we hadn't learned how to write by hand during our younger days, we might not have been able to do it. That is a possibility. If we were not trained in primary school on how to print and then do cursive writing, we would not be doing it now. Thanks to all primary school teachers for their patience and dedication in teaching. Yes, that's right. We owe them for teaching us the basics of handwriting. I'm glad we're able to make good use of our teachings in school. It's something that will be with us for the rest of our lives. In a way you are correct. Good handwriting is just rare but people who do have good penmanship are still out there. You'll usually find them among fountain pen crowds, or bullet journal crowds. It would be nice to bring Writing back in our school curriculum and have teachers who are strict about hand writing. Gosh, I hope not! I think writing is important even if we have computers and other forms of technology. There’s always the risk that if something happens to the planet and we didn’t have electricity we would still need to write to communicate. I don’t think the art of the written word will disappear anytime soon. Me too. Sometimes we're dumbfounded by how much technology has changed our lives. In fact, in some respect, it has made us lose certain traits. Lots of us have forgotten about the essence of good handwriting in favor of printed ink. I also thought about that too. Everyone should learn how to write as this might be the only way for us to pass on information like history and letters to future generations even without the use of any technology. Also, there might be a chance for the data that is saved in a computer might get lost but with writings on paper, it will stay there as long as we will take care of it. In the future I think that this has a lot of potential of happening. More and more people are using their computers and cellphones and i think in about a hundred or 2 hundred years people will forget that paper ever existed ! I agree, that eventually handwriting would be a thing of the past, a relic of the olden days. When would that happen? I think in the next hundred years. I don't think it will happen that easily. Writing is something ingrained in humanity. You'd pretty much have to wipe out all other forms of knowledge before you even come to close to that scenario. And even if they do, people are quick to learn and create writing once again. You have a very great point. Writing is a skill of humanity, and erasing this opportunity in them is like erasing a part of their knowledge. Yes, it's part of our culture as human beings. As long as we're born with hands, we'll eventually discover how to write. Whatever form it may take, writing is still writing. Yes, you only need to look at how long writing has been around for, too. On the walls of caves by ancient civilizations - and writing has still prevailed to this day. I think we're safe that it won't die out any time soon. I don't see that anytime soon. Writing is one of the most important things we do here on earth. It helps us take down things, remember things, learn things and it has many benefits to it. One thing I can say about writing is that mostly every professional needs this. Technology is developing but we must stay at our roots and remember the things that are very important for us to use and do. I don't think people would forget how to write. Well, surely, maybe after hundreds of years, paper may be obsolete. But, that doesn't mean that we cannot write anymore. Maybe, the future could have a gadget that acts like a paper. Something that people and students can write at and when they're done writing, they could just like swipe the file to the direction where they want to submit it. I think that people will not really forget to write because it is one of the fundamentals or basic when writing an article. No matter how progressive we are and have some advancement in technology already then I am sure that people will still learn to write things on their own. It is very hard to delete those things that you have already used to it. The time might come when very few people will using pens and papers for writing. I'm sure though the same way we have people studying dead languages there'll be scholars who'll keep the art of writing by hand alive. Technically though since roman characters will still be used in writing, should the need to write by hand arise once again, then everyone who can read can still write. Since writing neatly is an art that has to be learned, their handwriting however will be rather horrible. Out teachers called it chicken scratch. I don't think people will forget writing. It's just that people find it more convenient putting everything on their gadgets instead of writing it to a paper. There are also some technologies that lets you write on a gadgets so definitely people will forget writing. I agree with you. The absence of paper doesn't necessarily mean that the humanities' skill of writing will also disappear. You are right. Remember, people in the past already know to write even before the very first pen or paper was invented. They also know how to communicate even before the alphabets were created. It is the nature of human being. This isn't a possibility at all. Even till now there are people who are dedicated to calligraphy, and there are more people who prefer using pen and paper over digital means of writing. Fountain pen enthusiasts are one of those people who would make sure that the use of writing will never be obsolete, there are also BuJo/Planner groups as well who still prefer writing and making their own journals/planners rather than having a ready made or digital ones. Nah, I highly doubt it. But I'm sure the writing speed of many people will decrease. Imagine how awful it is if someone types with an autocorrector on the phone. Then he is busted for some extra trouble, as to regarding grammar. Writing on a paper won't have autocorrector for spelling, hehe. You are definitely right. When people always use their gadget for writing and not in actual paper they would definitely slow in writing but it will never forget. I actually find writing on gadgets as simper, easier and quicker than doing so on a paper. It is simpler because keyboard can suggest words. Your concern is genuine. I have gone sometimes for weeks without putting pen to paper. With devices like smartphones, tablets and laptops it's easy to type a note here, a reminder there, an idea here. It kind of makes you forget the need to get a paper and pen. But I still do find the need to write things down by hand sometimes. Could writing on paper get lost? Maybe. But that'll be really hard, unless schools stop teaching kids to take notes with pens on paper. I know what you mean, in the last month alone I've written hundreds of content but it was all typed on gadgets and computers. The only time I've written something in the past month was when I deposited some money in the bank and when I registered my name, designation and company in an event I went to. I don't think people would forget how to write. Even if future advancements will promote ebooks and anything to be typewritten or to be written through electronic devices, people will still be using handwriting. It is the basic unit of recording things and it one of the first efficient ways to deliver your message to anyone and communicate with them. If there will come a time that writing through electronic devices would be prominent, human would still be mimicking the symbols and letters they see in their environment in order to pass or transfer a message. I think you have a point. As for to-day gadgets are in studying. I may come to a day that children would not have to write anymore. Just copy and pasting lesson in school. Writing will never be out of style even in the rise of technology. It is one basic composition of human knowledge. It started during our early years of education. In fact, we are successful in writing our names on paper. It was a struggle but rewarding. I don't think it's reasonable to forget or ignore the skills in writing. Besides, it's not always good to practice paralytic style just for the advancement of technology. It is always preferable to use mind and body to complete human experience. I think that it could maybe after another millennium people may seldom write. But there would be some that will, especially the Japanese and Chinese people who holds the art of writing as a discipline. Besides, If we did advanced to a time when we no longer need to write, then maybe those are also the times that time machines are invented. And as one goes back in time, they would be amazed just how we (the humans of the past) have wielded such instrument with grace ( haha pun intended). But as for now I don't see that we would ever get to a point when we no longer have the need or the luxury to write. I don't think writing with your hands can be obsolete. Writing is essential in learning. It is one of the basic skill a person should have to learn more. Though hand writing can be lessen by the continous advancement of technology and some several factors but hand writing will never be outdated. I'm not sure if it's ever going to be possible for writing to be lost forever in the future. What can be said in my opinion would be that technology would influence the mode of writing but it's something that would remain with us for decades to come in the future. I don't clearly understand by what you mean about forgetting how to write. Take note that writing is one form of communication and until the pen and paper are around then writing with the hand will also be there. Not everything can be written on the keyboard because there are things that you will need the paper like the grocery list unless you have a printer at home and you use the computer for everything that you do. 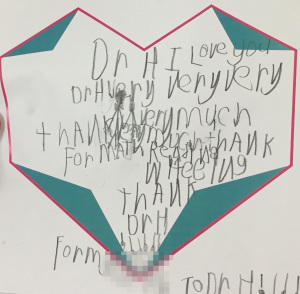 My husband works at a school and recently some fourth grade students wrote him notes of appreciation for the work he does. They were adorable, but I thought the writers were much younger than they actually were due to the fact that their writing was hardly more than scribbling, and they had no sense of correct spelling. I have to wonder if their teachers are bothering to teach them penmanship anymore. It's entirely possible that handwriting will become a lost art, if what I've recently seen is the best that our young people can do these days. Your husband is a holy man. It's great that there are people who inspire youth. Myself in the school I've barely had such teachers. Overall, I don't think that writing will go extinct, although, even governmental offices use virtual tools. For example, when I went to receive my password I filled out all the information on an Ipad. I think it's impossible for next generation to forget how to write because it's an art of expressing your feelings, emotions, experience and imaginations. I'm a millenial but I have always love reading booms and I really appreciate it eslecially the authors who invest their time, effort, ideas and passion to bring us something to read. In our generation right now, there are still a lot of readers and aspiring writers who get inspired with other writers. I think I would still stick with writing on a paper because it is what I had already been doing before, I cannot imagine myself writing from other things other than a piece of paper. I know that we can encounter a lot of advancement in writings but it is really hard to forget what we have started. I don’t write as much as when I was in college. But still write. I don’t everyone would forget writing completely. Though paper becoming obsolete thare are still apps in our device where we can write. I dont think people will forget how to write. When people learned and knew how to type in keyboards or even in smart phone obviously people would know how to write too and for that they would never ever forget it. I don't think people will forget how to write. Writing is such a wonderful form of art that most of the people can learn and develop. Even though there's a possibility that paper will become obsolete someday, which I think is impossible to happen, I don't think that people will forget how to write. Mainly because it is necessary for everyone to learn as it takes to play a big role in our lives. It may act as a bridge for us to communicate with other people without the use of technology which I think is very conventional. Yes, I do feel, eventually, people will forget how to write on paper. With the advent of technology, iPads, laptops, online writing and editing software, people are moving towards digital writing. It is more convenient to write and edit work online and also you can at any time, re-write anything you want to. Also, people argue it is environment friendly as more paper would mean more cutting down of trees so they are indirectly contributing to the conservation of environment. Schools these days are moving towards conducting exams online to save paper and this has been received well by the students. No. People will never forget how to write using paper and pen or pencil. I do see though that cursive writing or writing in script has become somewhat of a lost art. Only a few people can do it these days. Beyond that, only a few can do it legibly. Others produce chicken-scratch script. I don't think people will forget to write it's just that it will be tiresome to them to write since there are high technologies already. They can write on their smartphones, tablet or laptop using voice typing. As long as language exists, writing will never die off. Even if writing on paper becomes obsolete, we will always know how to write letters overall because we have the innate ability to use a writing medium to draw/write anything we want. That sounds right as we can always use writing to interact with others in a particular language. What is going to happen is an improvement and not writing becoming obsolete. As long as people can think thoughts, they'd be able to write. It's hard wired to our development from such an early age that I don't think people will forget. Maybe in the future, if certain movie like situations are met where humans communicate in another way (like telepathy), then sure there might be a possibility of people forgetting how to write. How will people communicate when they forget how to write is something that we should be looking at and not the reason for such. As far as I am concerned, it is essential that we understand that writing is an art that will definitely continue in the long-run. I don't think it will happen, it may change but definitely not be forgotten. Sometime in the future with all the technological advancement we could potentially come up with a new form of communication but people would still need to think thoughts and reading and writing is part of that development. As long as a language is used, writing will also be used. I think people will never forget to write even in these Technological age. Writing is still being taught in schools and is still practiced. In my country, writing is still the main thing we use. Computers, laptops, Ipads, tablets are just additional gadgets that makes things easier and more convenient. Will people forget how to write: For me it is impossible to happen, as long as there is what we called education writing will never and ever be vanish. It is the simplest foem of communication without this kind of knowledge I think it was the start of the end of the world, just saying. How does your writing changes people? What are your favorite underrated books that people should know about?